Total Workshop search results: 42. Displaying Page 1 of your woodworking search phrase CHILDRENS SWING. 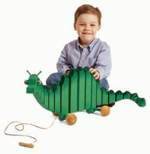 Kids will love tugging on this 3-foot long dragon, thanks to his flexible center core of canvas. That pliability gives Mr. Wiggles a mind of his own as his head and tail swing to and fro in random fashion. This bells and wood balls are a toddlers delight. Colored balls pop in and out of the double sided device to ring rows of assorted bells and clatter through swinging dominos. Design is inspired by bright European colors to enhance the project. We are proud to present our Childrens Airplane Rope Swing. Easy to build. Hang with rope from a suitable structure like a swing set, porch or tree branch. Full size drawings! This is a vintage woodworking plan. Visit our FAQ page for a full definition. View the Larger Image Slideshow to see the actual item you are buying. 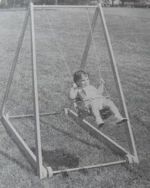 You cannot buy a swing like this but you can easily build one using this craft pattern. It was designed for children but it will support grown-ups. The swings momentum is obtained and maintained by pushing on the foot levers and alternately pulling and pushing on the handle-bar. Full size patterns are shown for all parts, and every bolt hole is located for assembling. Details are also included for suspending swing from a tree or trestle. Build this deluxe swingset using these free downloadable woodworking plans. features include a wide platform, spot for a slide, monkeybars, and 3 ladders. This is a vintage woodworking plan. Visit our FAQ page for a full definition. View the Larger Image Slideshow to see the actual item you are buying. Adapted to modern needs, this swing is just the thing for busy mothers and energetic youngsters. In the summer, you can place it in a convenient spot in the yard for watching while you work. Roll it in or out of the sun for the child or out of the way for grass cutting. In the winter, it can be set up in the basement, where it will keep the children busy and contented. It has been designed for the young members of the family, but it has a built-in safety factor, as the children grow older and the swing higher. Placed on a flat surface such as a driveway or basement floor, as the child swings high, the frame will be prevented from tipping by the wheels which will bear the weight of the frame and cause it to slide rather than tip. You can purchase a swing seat of your choice inexpensively from a mail order or hardware store. This craft pattern includes material list and all details. This is a vintage woodworking plan. Visit our FAQ page for a full definition. View the Larger Image Slideshow to see the actual item you are buying. 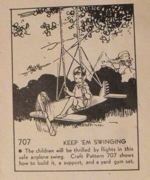 The children will be thrilled by flights in this safe airplane swing. This pattern shows how to build it, a support and a yard gym set. Propeller is 22 inches across. Get the children involved helping you build this tree swing. Here is how to build and hang it. We provide full size patterns to make this cute doll cradle. Easy to build with 3/4 inch thick lumber, a perfect project for the beginner woodworker. Using our full size drawings, this Colonial style hooded baby cradle can be built using 3/4 inch lumber. As the baby grows, the solid construction methods will allow this piece of furniture to be passed from child to child and generation to generation. Or use as a display piece for blankets or other storage. Plan includes cutting diagrams and a materials list. Using our full size drawings, this cradle can be built using 3/4 inch lumber. Solid construction methods will allow this piece of furniture to be passed from generation to generation. Plan includes cutting diagrams and a materials list. Spindles are spaced correctly with safety in design, swing is limited and end panels are solid for durability. This is a scaled down version of our larger pendulum swinging baby cradle.